I'd like to introduce the lovely Joanna Pace, she is such an inspiration. I have been following her sister Janet's Facebook Page Fitness to Faithfulness and I am truly grateful she was happy to share her transformation with us here today. How fabulous does she look? Rocking it Mama Joanna, like a true rock star!!! Joanna dropped 3 jean sizes in less than 9 months! I am 46 years old, married 25 years, and have three gorgeous children ages 23, 19, and 16. Ever since my pregnancies, I have always stayed active, working off the baby weight, doing aerobics. The older I got, extra weight was hanging on. I started running in 2000 and that seemed to work for awhile. Since, I turned 40, I was not happy with my body shape. I was working out hard, but never seeing any changes, weighing 150+ wanting to give up. I had the mindset that since I was working out, I could eat anything I wanted! Big mistake! I was negating everything I was working hard for! In Feb. 2012, I started Turbo Fire and loved it! But, still frustrated with no weight loss. I was still eating as I had always done thinking I was eating healthy! 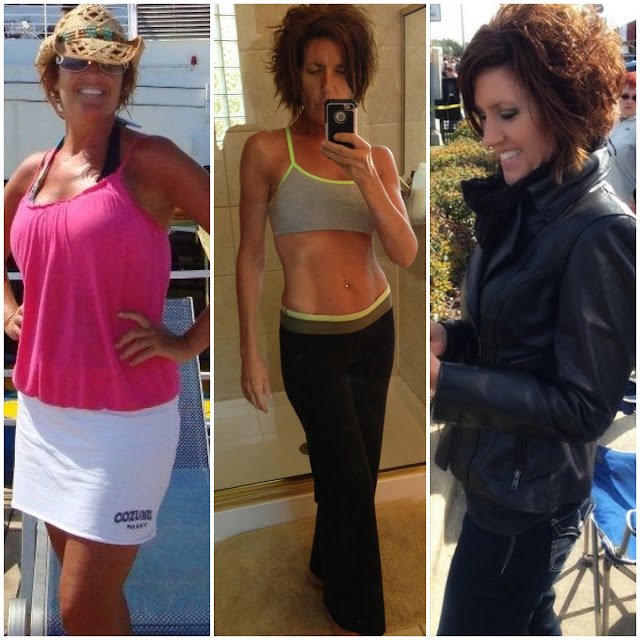 On August, 5, 2012, I decided to make a change and my healthy fitness journey began. I began to track my calories with the My Fitness Pal app, started making healthy eating choices, cut ALMOST all the sugar out of my diet, and worked out with Turbo Fire. Then, and only then, did I start seeing results! I was losing 1 lb. a week! By March 6, I had lost 24 lbs. weighing 126. I have had a 16% change in my body. I have lost 4 jean sizes! I am now a size 3! As a kid and up until last August, I ate anything I wanted, mostly not healthy...casseroles, fried foods, desserts, fast food. I ate a ton of sugar and I snacked a lot! It didn't even register to me that I was eating unhealthy until I started tracking my calories. I was shocked! Now I do not go over my allotted calories for the day, no matter what. I cut out desserts and sugary snacks and I only allow something sweet if I have any calories left over. If I snack, it is fruit, veggies, or almonds. My biggest smile of the day is if I have enough calories left over to allow myself to have microwave popcorn in the evening! My eating has totally changed and I will never go back. It is a lifestyle change, for sure. I have never played sports per say, but after Turbo Fire, I consider myself an athlete! I am stronger than I have ever been before, I can jump higher than I ever have, and my body looks better now than when I was a skinny 110 lb. teenager...before children! Growing up, I hated to sweat. The sweat pours off of me now and I love it!! I love watching my son play high school football! Go Seven Lakes! And I love watching my home football teams, the Houston Texans and Texas A&M play! Huge fans! What makes me smile? My children and my husband! I have been a homemaker for 25 years and absolutely love being a mother to my three children! I have dedicated my entire adult life to being the best mom and wife I could be! I love Jesus! He is the whole purpose of my life! Without Him, I would be nothing! I am a praise team singer at Second Baptist Church, one of the largest churches in Houston. I have the privilege of singing to thousands of people every single week. I am also involved in a women's praise team, Watershed, that I am so blessed to be a part of. I love movies and books and have a huge collection of both! My favorite pastime is sitting down and watching a movie with the family, by myself, in the theater, at home, anytime! I love it! My catalyst for my lifestyle change was after seeing pictures of myself on a cruise I took in July. That's what it took. I was so frustrated and really wanted to see a change. And I knew it had to be something totally different than what I have done in the past. Obviously, that was not working for me! The thing is, nobody thought I needed to lose weight. When I told them I was 150 lbs., they didn't believe me or that I wore a size 10 jean. I am the first one to admit that I could "rock" my clothes! The truth of the matter was that I was never content or happy with my body shape underneath those clothes. I was not making healthy eating choices and I negated my working out by thinking I could eat anything I wanted BECAUSE I was working out! I am finally happy and content with my body shape for the first time ever! And it's a conscience decision every day! My goal over the next 12 months, and really, the rest of my life, is to maintain my weight and continue on with my healthy lifestyle with exercise and healthy eating. It's a choice everyday! Everyday making that choice what my body needs...not want I WANT! Treating my body with respectful choices...it's the only one I've got!!!!! YOU CAN DO IT!!!! I thought I was always going to be the weight I was. I remember having a bad attitude thinking, well, might as well eat "that", it doesn't matter! I'm always going to have this belly pooch and these muffin tops! It's a hard road, but you can do it!!! If you have a not so good day today, be better tomorrow! Soon it will be a lifestyle! Choices will become easier! Eat more at home. Know what you are putting in your body! If you eat out, choose a salad or grilled foods. Know exactly what you are ordering! You can eat out and still eat healthy! Go online and check out their menus before going so you know what you are ordering! Don't drink your calories!!! Go ahead, get started today...you can do it.